Ollerton Town recorded their fourth win in a row in all competitions after defeating Appleby Frodingham 2-1 at The Lane on Saturday. After five games without a win, Dave Winter’s side have bounced back well and after wins against Dinnington and Thorne and a mid-week triumph against Clifton All Whites on penalties, they went into Saturday’s game in a confident mood. Appleby arrived at The Lane on top of the Central Midlands North Division after winning seven of their eight league games so far, yet it was Ollerton who started the brighter.Jamie Tryner saw an early shot balloon up after a deflection of an Appleby defender, forcing ‘keeper Patrick Shaw into a solid save. It wasn’t long however before Ollerton had the lead. Tryner clipped a ball over the top for Jamie Charlton and he managed to get the ball past Shaw before rolling it into the corner of the empty goal. Ollerton kept pushing for a second and Paul Burgess headed over a good chance before Charlton hit the side netting after trying to squeeze the ball in at the near post. 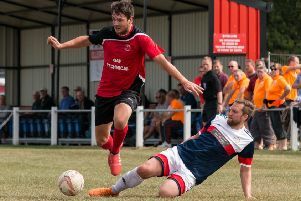 Ollerton’s Kyle Clarkson has been in brilliant form recently and went into Saturday’s game on the back of scoring free-kick’s against Thorne and Clifton. He made it three in three on Saturday when he produced his best goal of the lot, whipping a free-kick from the edge of the area across the ‘keeper, who was left stranded as the ball flew into the top corner of the goal. Just before the break, Ollerton had a good chance to make it 3-0. Charlton played a ball over the top to Chris Hewitt who ran into the area and fired just wide. Though 2-0 is a relatively comfortable lead, Ollerton were up against a side who had recently beaten Welbeck FC 23-0 and would have been expecting to be on the receiving end of the some of the fire power. However, in truth, Ollerton’s Simon Smith was never really tested too much and in fact, Ollerton could have scored again moments after the restart. After Clarkson was tackled near the Appleby box, the ball fell kindly for Charlton who carried the ball on and hit the upright after firing across Shaw’s goal. Appleby kept pressing for an opening and definitely saw more of the ball in the second half yet for the most part, their main threat was crosses into the area which Simon Smith easily dealt with. A brief scare came mid-way through the second half where Tom Cooke gave the ball away in the Ollerton box but thankfully Smith was on hand to save the effort. Ollerton had chances of their own and Paul Burgess headed over once again before Kye Pilmorecut inside but dragged the ball wide of the post. With the game in its dying embers, it looked like Ollerton could hold on for the 2-0 win and their first clean sheet of the season. However, in the last minute of the game, Paul Tait headed in what turned out to be a consolation for Appleby meaning Ollerton won 2-1 for the third league game in a row.